Across the MEA region, the paint and coatings industry is a growing market driven by investment in construction projects. 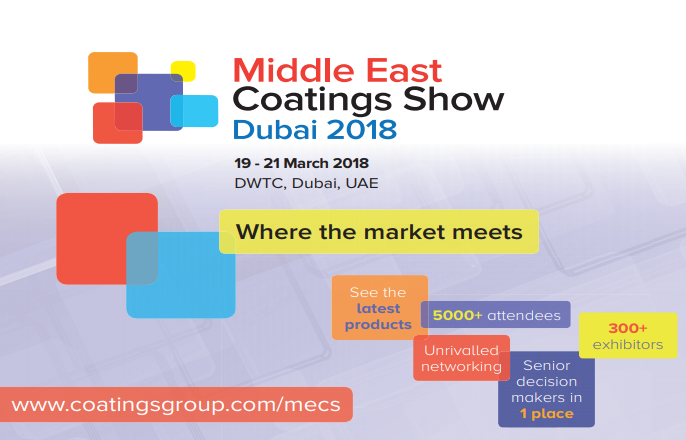 Massive government investments by Gulf Cooperation Council (GCC) countries have further fueled the coatings industry, especially in UAE (Expo 2020) In Africa, a few countries – such as Ethiopia – are performing well and growth is driving coatings for projects, as well as refurbishment. Over the past 18 months, we have observed that architectural coatings remain the leader in the paint and coatings industry in MEA. On the other hand, the construction industry is indicating much growth potential in North Africa along with the countries of the Southern African Development Community (SADC). Political stability and economic indicators mainly account for this. The major challenge in MEA is implementation of strong environmental regulation on a wider scale, which can create opportunities for the coating industry to introduce new and advanced solutions in the market. However, the push for regulations should not only come from government. Manufacturers should also take the opportunity to enhance product development and distinguish themselves. Sustainability and health are ever-increasing priorities for many end consumers. In the construction sector, Musclerox tries to push the establishment of enhanced construction conventions. As an innovative company, Musclerox has always outperformed others in providing solutions to manufacturers and end users in the coatings industry. We have upheld our commitment to the market and introduced binders for low-VOC and low-odour paints and speciality binders for easy-to-clean applications. The market has also welcomed our innovative products for such applications since we support the development of next-generation coating solutions. As for the construction industry we have introduced a couple of applications including a new polymer for large tile adhesives, a latest hydrophobic grade, as well as new material for Gypsum application. We expect the MEA coatings market to grow by 3-4% in 2018 and to cross the mark of US$10bn* driven by architectural coatings accordingly, we expect the market for polymer powders to grow further, too, over the next year. As Musclerox offers sustainable high performance solutions, we are cutting edge and looking forward to the results.